This work offers the student of biblical studies an introduction to the interpretative study of Jesus. It introduces students to the writings on Jesus and the main strands of critical interpretation. It studies the portrayal of Jesus in the four gospels with the tools of historical analysis, but with the understanding that it is the nature of the gospels which prevents history being the only concern. - Publisher Using the tools of historical and literary criticism, this book offers the student of biblical studies with an introduction to the interpretative study of Jesus. 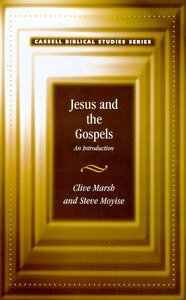 About "Jesus and the Gospels"
Using the tools of historical and literary criticism, this book offers the student of biblical studies with an introduction to the interpretative study of Jesus. Steve Moyise (Ph.D., University of Birmingham) is professor of New Testament at the University of Chichester. He is author of The Old Testament in the Book of Revelation; The Old Testament in the New and Evoking Scripture: Seeing the Old Testament in the New. He is also coeditor with Maarten Menken of a series exploring the way particular Old Testament books are used in the New Testament, including Psalms in the New Testament; Isaiah in the New Testament; Deuteronomy in the New Testament, and The Minor Prophets in the New Testament. Most recently he has produced Jesus and Scripture and Paul and Scripture: Studying the New Testament Use of the Old Testament. Jesus - Prophet Of Doom? Jesus - Witty Word Spinner? How Christology Works - The Gospels In Practice.